Spanish Market is this coming weekend July 27th – 29th, 2012! Everything begins to kick off on Friday with the setup of the market on the plaza. Come join us for a weekend of art, culture and fun! Spanish Market attracts both the local community and collectors from all over the world. It is a colorful festival, featuring traditional art, music, dance performances, demonstrations, pageantry and regional food. 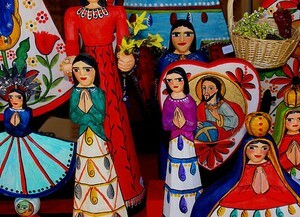 The Spanish Market was sponsored by the Spanish Colonial Arts Society back in the 1900’s. 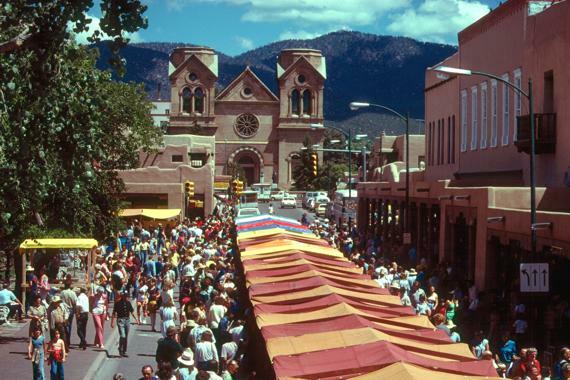 The market that used to be small and intimate has now become the largest exhibition and sale of traditional Spanish art in the United States with over 250 native New Mexican artists– many of whom have been recognized nationally. There are even young children who participate and learn from their elders. This entry was posted in Uncategorized and tagged art society, arts, culture, Historical, history, mexican artists, santa fe day, spanish colonial, spanish colonial arts, spanish colonial arts society, spanish market, traditional art music, travel, vacation rentals. Bookmark the permalink. 2 Responses to Spanish Market! This sounds like fun, I love Spanish art and culture..Wish I could make it! Be sure to take lots of pictures and tell us all about it.